so we went to Broadway Market to get something for her. On the way to the market, we had lunch in the Italian cafe where I had wanted to go so long. 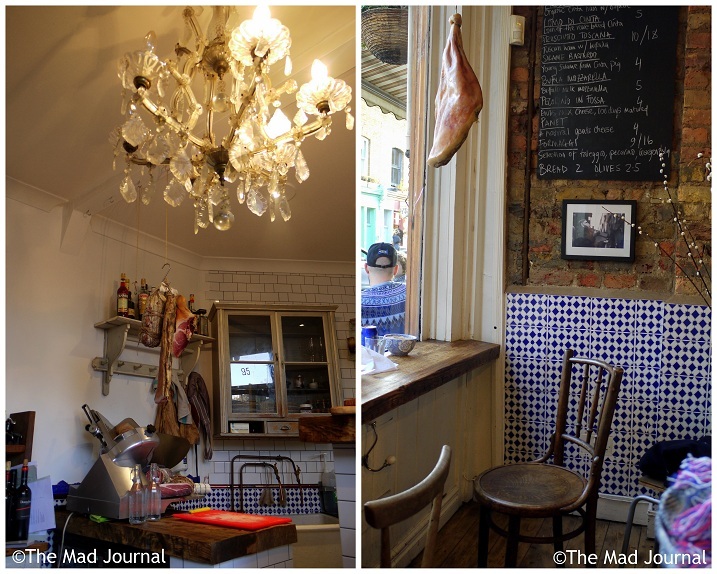 It's Campania Gastronomia in Columbia Road. Everytime I passed the cafe, I always wanted to get in but it was full. so we always goes there on Sunday too. But I guess everyone thinks same, the cafe is always full on Sunday! and it's on Saturday, we thought it should be fine. So we went there! But......I think everyone was thinking same, the small cafe was full even on Saturday. But we managed to get seats. This shop has the nice natural interior and it made me feel at home, I liked it! I know.... I can't judge restaurants by appearance. But girls should think they want to have good meal in nice place! Joking aside, this packed cafe is the proof of the popularity of it. we ordered pasta as a royal road. 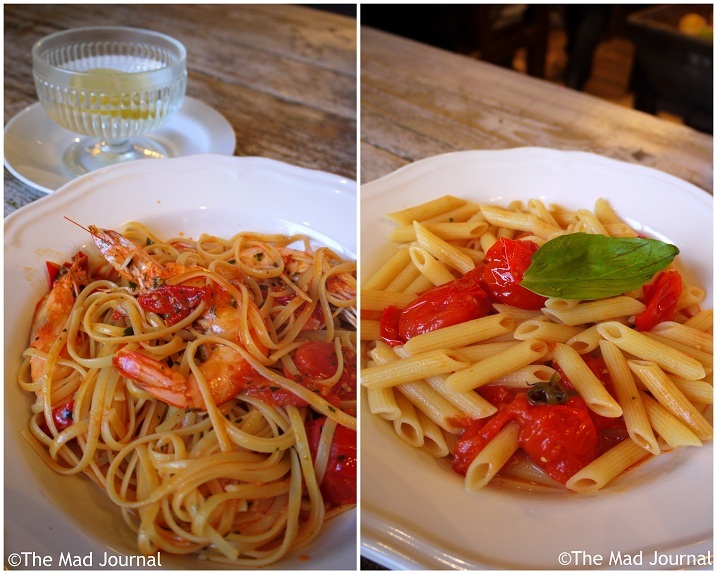 I ordered the pasta with tomato and prawns as I love the combination of them. The pasta was so good al dente, it was delicious! The prawns are big and so fresh though it was hard to remove their shells. My partner took the simple tomato and basil pasta. Although it was good too, it was difficult to choose that pasta or the risotto which he wanted in the beginning. He didn't choose the risotto because he didn't like clams but I DO! The chocolate tart sounded good, however, we wanted light desserts. So we took Mascarpone and plum jam. The mascarpone was so rich! The plum jam looked home made and tasted nice too! It was a little bit too rich as we wanted light desserts, but we enjoyed it. I recommend you to come not on Sunday if you really want to have meal here. or, they have take away, you can have panini and coffee outside with the street musician's music.